I'm pleased to be here for today's LME Asia Metals Seminar, among the highlights of this fifth annual LME Asia Week. The main highlight, of course, is you: all of you here today, all of you attending the Gala Dinner this evening. You are among the most knowledgeable, most influential, of the world's metals participants. And I welcome you all to Hong Kong. I confess I don't know much about business of metal. I do, however, note that metals have a reputation for being hard and tough. That they can take a beating, without breaking. And, no less important, that nearly all metals have high melting points. Something worth noting, given last year's less-than-shiny commodity market results. Yes, total LME volume came in at about 160 million lots in 2016, down 7.7 per cent from 2015. Year-end LME futures market open interest also dropped 4 per cent, year-on-year. Looking ahead, there is a silver lining. There are bright sides that we can look forward to, and that is China and developing Asia. Together, they will continue to be the global economy's main engine of growth. The latest forecast from the International Monetary Fund projects growth of 6.5 per cent for China, and a similar magnitude for developing Asia this year, whereas the projected growth rate globally is only 3.4 per cent. China, the world's second largest economy, is already a major consumer in the global commodity market, and its Belt and Road Initiative, which encompasses some 65 countries across Asia, Europe and Africa, will provide the much-needed new impetus to the global economy. By increasing investment, improving infrastructure connectivity, promoting economic integration, enhancing free flow of goods and capital and encouraging people-to-people exchanges. In short, China has the potential to lift the demand in the commodity market and a range of related industries. As for Hong Kong, we are the world's leading financial capital in Asia, as well as China's international financial centre. We can provide businesses in the Mainland and Belt and Road countries with a wide range of financial services. Initial public offerings (IPOs), to be sure, but also post-listing capital raising, bond issuance, bank loans and offshore Renminbi business opportunities. Thanks to our unique advantages under the "one country, two systems", our strategic location, our multicultural capability and our singular global experience and connection, Hong Kong is the critical bridge between Asia, and particularly the Mainland, and the rest of the world. 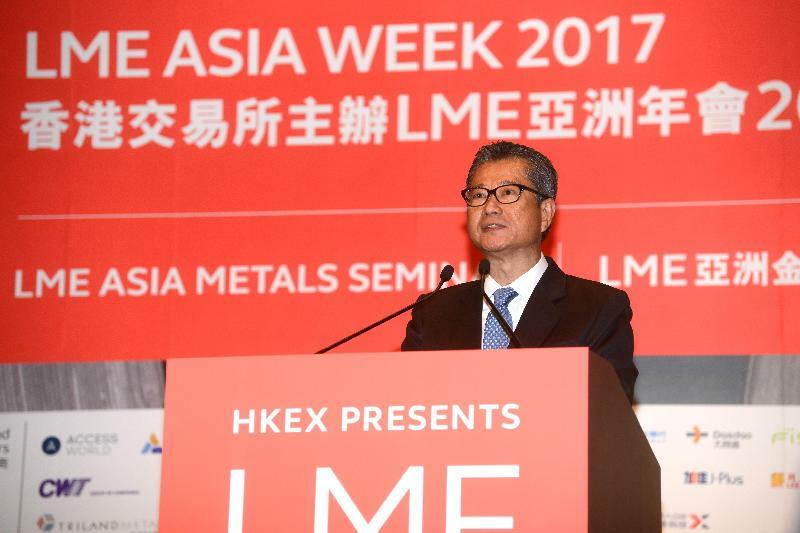 On the commodities front, Hong Kong enables easy access to the LME and its wide-ranging product offerings. They include six London Metal Mini Futures contracts. These are traded in Renminbi and the LME's global reference prices. With Hong Kong's Asian time-zone advantage, they give base metal users, producers and investors, worldwide, more hedging and risk-management tools. And there's a broader range of commodity products in the pipeline, I'm pleased to note. The HKEX is planning to launch gold futures contracts in US dollars and offshore Renminbi. A first for Hong Kong. HKEX will also launch, here in Hong Kong, index-linked and cash-settled iron-ore future contracts denominated in US dollars. These and other moves will enrich Hong Kong's product offerings. They will also provide a risk management and trading platform for both Mainland and international investors. And we have only just begun. China's 13th Five-Year Plan, now into year two, reaffirms Hong Kong's status as a global offshore Renminbi business hub. It supports our participation in the two-way opening up of the Mainland's financial market. For good reasons - and a good many reasons indeed. First of all, Hong Kong is home to the largest offshore Renminbi liquidity pool in the world. We are the largest, as well, when it comes to Renminbi trade settlement and payment, accounting for some 70 per cent of the world's offshore Renminbi payments. Hong Kong is also a centre for Renminbi innovation, offering bonds, investment funds, shares and currency derivative products. For several years now, the HKEX has been a leader in US dollar-Renminbi liquidity and distribution among exchanges. Indeed, we account for about two-thirds of the world's exchange-traded US dollar-offshore Renminbi futures. To add to its offerings, HKEX, in February, introduced its first currency option product - the US dollar-Renminbi options. Looking at investment funds, the Mainland-Hong Kong Mutual Recognition of Funds Arrangement, launched nearly two years ago now, has enriched Renminbi fund product variety. It remains the only such scheme in the world between the Mainland and an outside market. And, of course, there is Stock Connect, which has taken Hong Kong's role as the gateway to Mainland markets to new heights. The Shanghai-Hong Kong Stock Connect, initiated back in 2014, was followed last December by the Shenzhen-Hong Kong Stock Connect. Stock Connect gives international investors smooth access to the Shanghai and Shenzhen stock markets through Hong Kong. It also makes it easy for Mainland investors to take advantage of companies listed in Hong Kong. And Stock Connect is only the beginning. The concept will be extended to other product types. In March, Premier Li Keqiang announced the soon-to-be-launched Bond Connect between the Mainland and Hong Kong on a trial basis this year, that would allow overseas capital to access Mainland bond markets, offshore, for the first time. We are now working on the scheme with relevant Mainland authorities. We shall also promote mutual access of exchange-traded funds to expand securities trading under the Connect initiative. This can only lead to more investment choices for investors. Allow me to turn now to one of our strongest suits - our listing platform. Last year, Hong Kong ranked first, globally, in funds raised through initial public offerings - and for the second year in a row. Let me add that we have been among the world's top five in IPO fundraising since 2002. We have, in short, the financial prowess, and means, to make a difference for the Belt and Road Initiative. To that end, our Securities and Futures Commission issued a statement, last month, regarding infrastructure project companies and how to assess their eligibility for listing on our Main Board. We hope to further develop our listing platform, reinforcing our position as an equities leader and market of choice for Mainland and international issuers. In that regard, HKEX, I know, is looking at ways to enhance the competitiveness of Hong Kong's listing platform. It includes reviewing the Growth Enterprise Market and assessing the feasibility of introducing a new board. We are looking, in short, to attract a more diverse range of issuers. I know that you will hear a good deal more about opportunities available in Hong Kong, and throughout Asia, at today's LME Asia Metals Seminar and throughout LME Asia Week. I wish you more business shine this year and an enjoyable stay here in Hong Kong. Thank you very much for having me this morning.